The results of your DATs test enable you to see how you did in a range of different aptitudes. Some aptitudes are likely to be better developed than others, and this suggests that you are more naturally skilful in those areas. Others are less well developed, and choosing subjects, courses and jobs that require high ability in these areas may be more challenging for you. The sections below will give you a better idea of what each of the individual aptitudes mean and of how an understanding of each can help you in choosing a career you are suited to. Usually, students follow subjects and careers that build on their talents and best abilities, but this need not necessarily be the case. The tests don’t measure everything, so it is critical to combine the information here with several other measures of your ability, skills and interests. 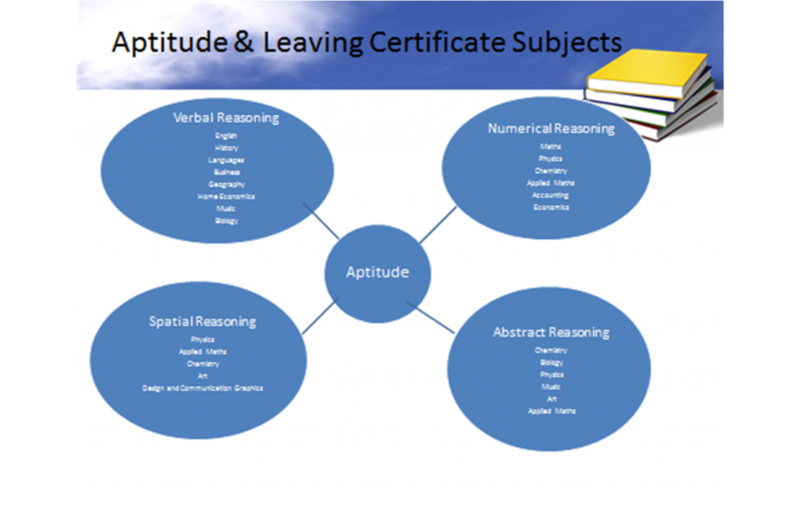 Take note of the subject and career options when considering your Leaving Cert subjects, being especially careful if taking subjects that are associated with those you scored lowest in. What the ‘Percentile Scores’ mean. Your percentile tells you where you rank on a test in comparison with others in your year in numerous schools across the country. If your percentile on a test is 50, you are in the middle – that is, one half of students in the national group did better than you and one half did less well. If your percentile on a test is 80, you did better than 80% of the group – i.e. only 20% did better. Likewise, if you scored at the 25th percentile, this means that you did better than 25% of students, but less well than 75%. Verbal reasoning refers to the ability to reason with words, and to understand and use concepts expressed in words. An average score means you should feel fairly comfortable working with ideas expressed in verbal form. You will probably also be reasonably good at expressing yourself in words. Verbal reasoning ability is important for any work involving the communication of ideas or the interpretation of written material. It can also be important for many kinds of work, in which analytical thinking is required. Areas of work in which these abilities are required are professional jobs (e.g. lawyer, doctor, teacher), technological jobs (e.g. engineer, computer programmer), business (e.g. management, sales, marketing and advertising), scientific work and also many fields of work in which communication is of primary importance (e.g. training, work involving the production of written material and administrative positions). It is also important to have fairly good verbal skills if you wish to undertake further training or study, especially in one of the more academic fields. English, History, Languages, Link Modules, Music, Art, Religious Education. Numerical Ability measures the ability to reason with numbers and to deal intelligently with quantitative measures. It is important for work in the technical professions such as science, engineering and architecture. It is also important for many jobs in business and finance (e.g. sales forecasting, banking, etc) and is very much needed for work in accounting. In the technical area, numerical ability is relevant to any sort of work in which calculations or precise measurements need to be made (for instance, surveying, navigation, joinery or laboratory work). It is also important for many clerical or administrative jobs (e.g. local government, accounts administration, etc.). Educational Aptitude is a measure taken from the combined scores of Verbal and Numerical Reasoning. The combined score is taken as a general indication of your ability to learn from books and lectures in a traditional academic environment such as a school, college or university. It is also considered to indicate the potential for jobs of more than ordinary responsibility. Subjects that benefit most from high scores: All Subjects. This aptitude test measures a person’s ability to reason with abstract ideas, and is a measure of non-verbal, non-numerical reasoning power. It is concerned with being able to perceive patterns among complex elements and to be able to see how those elements relate to each other, for example, patterns, diagrams or designs rather than words and numbers. The ability to think in abstract terms is needed for work which involves seeing relationships between things: either in a logical sense or in a practical sense. It is therefore useful for fields such as computer programming and software design, mathematics, science and engineering. It can also be useful in areas such as technical maintenance, which involves understanding how parts of a machine or system relate to one another. Abstract reasoning is also important for working in the field of design, since design is often concerned with the expression of abstract ideas or themes. Finally, abstract reasoning can also be very important in management, especially at the higher levels where one needs to see how the different parts of a complex organisation fit together. Physics, Chemistry, Biology, Music, History, Art, Applied Maths. This aptitude measures the ability to work accurately with detail and at speed. Such an ability is important in many kinds of detailed work (letter writing, form filling, filing records and entering information into a computer, i.e. most office work) and is also quite important for scientific or technical work where precision is required (e.g. computer programming or laboratory work). Furthermore, this is an ability required in all work where attention to detail and quality are important (e.g. accountancy, surgery, forensics and some types of legal work). As this aptitude measures speed and accuracy, low scores may occur as a result of a greater emphasis on correctness rather than a genuine lack of ability to work rapidly. The Mechanical Reasoning test measures the ability to understand the basic principles of machinery, of tools and of physical relationships between things. This ability is important for any sort of work involving the design, operation or repair of equipment and is also very important in the field of engineering and in some areas of product design. Examples of jobs in which mechanical ability is important are motor mechanic, gas fitter and repairer, industrial fitter, production engineer, civil engineer, aero-engineer, surveyor, electrician, carpenter, machine operator, product designer and builder. Physics, Applied Maths, Construction Studies, Engineering, Technology, Design and Communication Graphics. The Space Relations test assesses a person’s ability to visualise objects in three dimensions. This ability is needed for any form of work in which it is important to be able to visualise objects and to understand how they relate to each other. Examples of jobs where good spatial abilities are required are architecture, design, technical drawing, dentistry, the fine arts, and also any type of technical or craft work which involves dealing with objects at a practical level, for instance, in design and many forms of technical work). Art, Home Economics, Design and Communication Graphics, Construction Studies, Engineering, Technology. The spelling test measures your capability to recognize correct or incorrectly spelled common English words. This is an important skill in school, college and many jobs where there is an emphasis on writing. It is useful to compare this score with your score in Verbal Reasoning. If your Spelling and Grammar scores are much lower than Verbal Reasoning, then you may benefit from extra study or tutoring to help improve your English language skills. Otherwise your exam marks are unlikely to reflect your actual ability. All Science, Business, and Languages. Also History, Geography, Home Economics, Religious Education, Music, Art. This is a measure of how well you can distinguish between correct and incorrect grammar, punctuation, and capitalisation. It is an excellent predictor of grades in both school and college courses, i.e. if you score highly in this aptitude, you are likely do well at school and college in general. While such careers as writing and teaching require especially well developed language skills, nearly all kinds of work requiring college-level education demand a considerable competence in this area. Examples of areas in which good language skills are required are management, teaching, professional work (e.g. medicine, law, accountancy), work in the media (radio and television, journalism) and all forms of clerical / administrative work. All Business and Language subjects. Also History, Geography, Home Economics, Religious Education, Music, Art.